With the beginning of spring, Canadian poker players look to Regina for one of western Canada's longest running tournaments. With more than 20 years' history, the Station Poker Classic (SPC) at Casino Regina has become a fixture in the spring schedule of Canadian poker players. From the first running in 1997 when two small tournaments combined for less than $30,000 in prizes, the 2019 edition of the SPC ended up giving away more than half a million dollars in prizes over 5 events, including the opening day satellite. The action kicked off March 19 with the opening $200 satellite event, which gives away cash prizes. With 183 entries, there was more than $36,000 in the prize pool to fight over, and it came down to a battle between Regina's Mike Kirby and Winnipeg's Dylan Ellis. Ellis eventually bowed out in second for $6,211 while Kirby pocketed $9,764 for the win. The first actual event got underway on March 20 and attracted 255 entries to the $500 buy-in. That put well over $100,000 into the middle to play for with two familiar faces making it to the end to battle it out for the biggest prizes. World Series of Poker bracelet winner Tyler Bonkowski is a very familiar face on the Canadian poker scene with more than $1 million in live earnings, but he couldn't quite best Swift Current's Chris Bowers. Bowers collected his third Casino Regina ring and $30,198 for the win, while Bonkowski had to settle for $19,059 for second. Event 2 was a $700 buy-in freezeout event, and 221 entries ended up building a prize pool of $139,230. The final action came down to two players who often figure in the money in Casino Regina events, but rarely end up with all the chips. John Nicholls notched his fifth career cash, all of them from Casino Regina events, with second place worth $23,303, but it was Kerrobert, SK's Brad Heidt who got his first career win. In his sixth career cash at Casino Regina, he finally collected all the chips and took down the top prize of $36,814. Friday night is bounty night at the SPC, and it attracted 231 entries for the $900 ($720+$100+$80) knockout event. That put $166,320 into the prize pool, plus $23,100 in bounty cash. The heads-up battle came down to two players who had already guaranteed their biggest live cash and were looking for their first Casino Regina wins, but North Battleford's Brian Anderson couldn't quite take it down and had to settle for second and $27,760. The win went to Shawn Leis for $43,900 and his first Casino Regina ring in his fourth final table. The marquee event is always the $1,100 and the prize pool grew to over $250,000. Once again, it came down to a battle between two locals familiar with Casino Regina events. 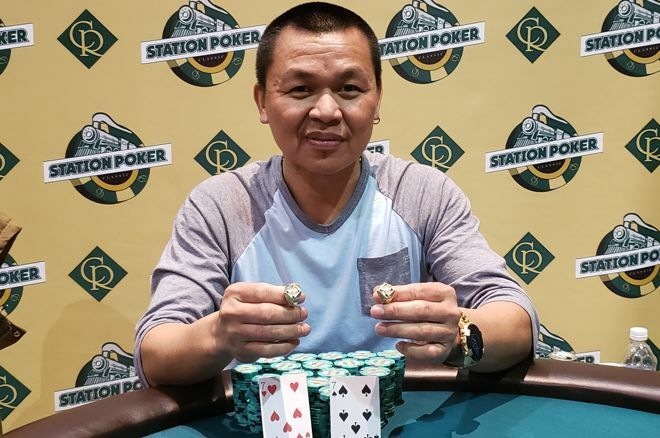 Hui Zhou picked up $43,587 for a second place finish, worth $43,587 but Swift Current's Bernard Elevado grabbed his second Casino Regina ring with the win worth $69,109. The SPC is the first of three annual poker series hosted by Casino Regina. The Harvest Poker Classic has it's 23rd running this fall, but next up is the new Diamond Poker Classic from June 11 - 15, 2019.